Comm1: IFR showcases the same type of realistic pilot-ATC audio dialogue, detailed flight scenarios and interactive simulation exercises that have been praised as the winning ingredients of Comm1: VFR Radio Simulator. Comm1: IFR focuses on honing and perfecting radio skills. By de-mystifying the "system" through step-by-step audio sequences and breaking down the radio calls that controllers rattle off into definable bits of information, Comm1: IFR helps pilots to become smarter and more confident in the cockpit. Pilots also have the opportunity to practice unusual IFR situations such as Radar Approaches, so they are better prepared to handle the unexpected. The goal of Comm1: Radio Simulator is to make radio communications "second nature" for pilots, so they can concentrate on flying the airplane. Review: It's a useful tool to build confidence on communication skill. Review: This is an excellent resource, however it would be nice if an updated version for glass cockpit were made available. Review: Over priced, great idea! But needs updating. For 80 "smackers" I expected more. Should be an on-line version for a less expensive price and immediate use. For eighty-some bucks they should include copying clearances. If you have money to toss around good to have. Review: When I listened to my first response, I knew that I needed to get better - both in VFR and IFR communications. I think that this program will accomplish that. Pros: Very affordable. Works fine on Windows 7; 64-bit laptop. Review: Haven't flown IFR in a while and this was just the review I needed. Review: The product is very accurate and similar to the real life situation. It's like talking to ATC with the option to rewind and reply at your own pace. Love the voice recognition, and the simplicity of the program. Cons: Having to load the disk every time I use the software is a bit inconvenient. Do I need a headset/mic to use this software? No, the headset is not required. Q: Is the IFR com software compatible with windows 7? A: Yes, it was recently patched to be compatible with Windows 7. 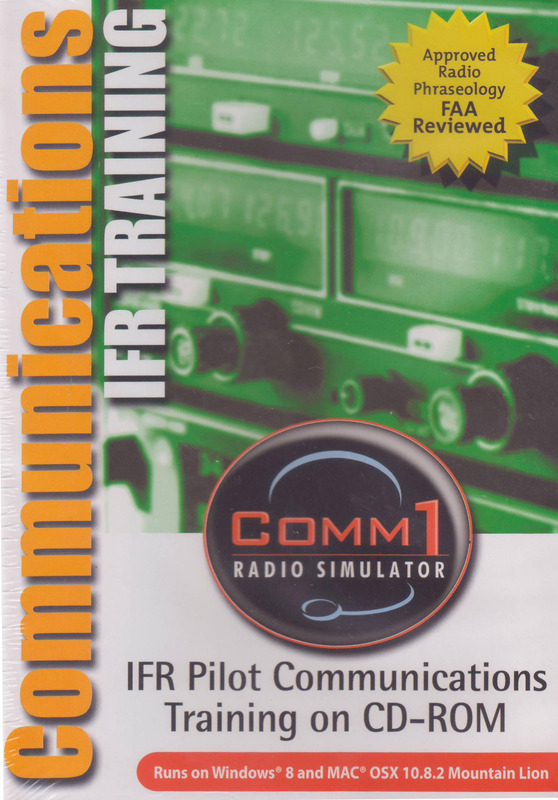 If you already own Comm1 IFR, you would need to contact Comm1 for the free upgrade. If you are going to be purchasing it, it should work out of the box for you. Q: Does include FAR, ICAO, JAR communication? This is intended to be training for FAA communications in the USA only. It does not go into ICAO or JAR communication. A: It is compatible with Windows XP and Mac System 7.5 - 9.2 but will not operate on OSX currently. 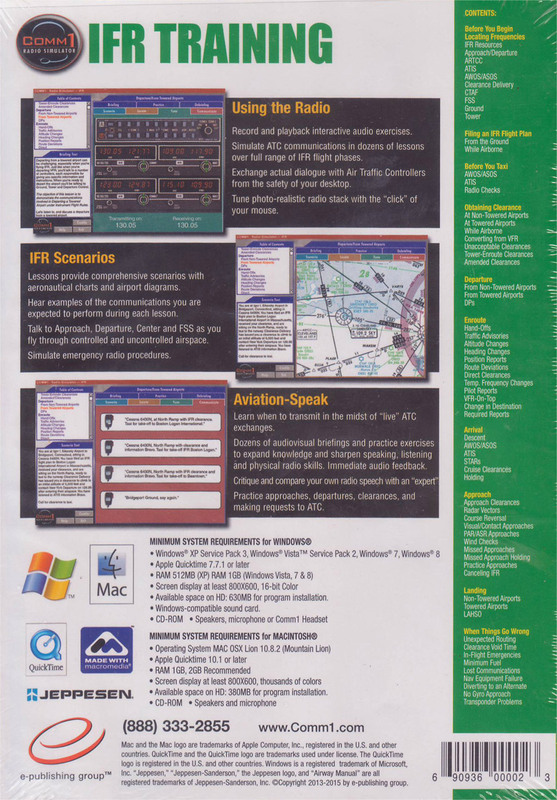 Q: is teh IFR Comm software compatible with Macintosh OSX? A: Comm1 IFR will work on Mac System 7.5 - 9.2 but will not operate on OSX currently. Q: Is the IFR com software compatible with windows Vista? A: Yes, Comm1 is fully compatible with Windows Vista.